This prescription-strength 5000 ppm sodium fluoride toothpaste aids in caries prevention, helps strengthen enamel and helps reverse white spot lesions. Contains tri-calcium phosphate ingredient (TCP), so Clinpro 5000 toothpaste releases a high level of fluoride plus calcium andphosphate—components found naturally in saliva. 3M ClinPro 5000 is THE best anticavity toothpaste. This is not sold in Europe, so I asked my dear friend to order to her U.S. address and she reshipped the product to Finland. You ALWAYS have very fresh stock! Last time I ordered four tubes in July 2018, and the best before dates are 01/2021! I have tried only Vanilla Mint flavor so far. Please read carefully the instructions printed on the toothpaste carton, you are supposed to use only a pea-sized amount, as this toothpaste is highly concentrated! Has good flavor, packaging is fine. My dentist is pleased. Wish it was twice the quanity! I have terrible teeth as a consequence of braces and poor brushing habits during that time period. I was recommended Clinpro5000 to help improve my teeth. Since using the product (6 months), I have had no new dental issues. This product also helped me with my sensitive teeth. The relief was not immediate, but after a week or two my teeth were not as sensitive anymore. This is a great product. This product is amazing! I'm so glad I could get it from Astonishing Skin Care! My teeth are less sensitive and I'm all smiles about it! Bubble gum, bubble yum. Side benefit; cleanings only for 10 years. What more can be said. CXlinpro50009 is a decent toothpaste and may discourage tooth decay (hard to prove). I hope is actually does deter decay as it costs about ten times as much as regular toothpaste,m even at the discounted price. 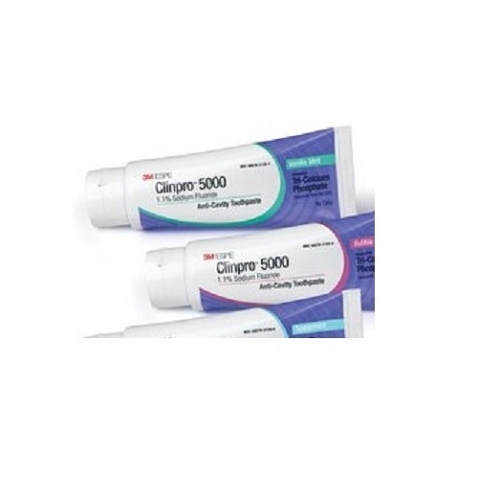 Clinpro 5000 toothpaste is recommended for Adults and Children over 6 years of age or older. Use once daily in place of a conventional toothpaste. Follow these instructions unless instructed by a physician or dentist. 1. Apply a thin ribbon or pea-sized amount to a soft-bristle toothbrush, and brush teeth for two minutes. 2. After brushing, adults should expectorate. Children 6 -16 years of age should expectorate and rinse mouth thoroughly with water. Water, Sorbitol, Hydrated Silica, Glycerin, Polyethylene-Polypropylene Glycol, Flavor, Polyethylene Glycol, Sodium Lauryl Sulfate, Titanium Dioxide, Carboxymethyl Cellulose, Sodium Saccharin, Tri-Calcium Phosphate.